December 31st, 2018 is our Annual New Year’s Eve Celebration. This will start around 4:30pm for socializing. There will be a Lasagna Dinner around 6:00pm. We will have games and puzzles for kids and adults. At 9:00pm will watch the “ball” drop on Times Square and toast with a glass of bubbly. 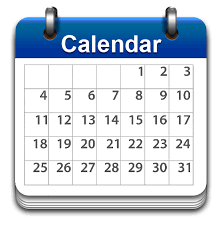 Then you are off to whatever else you have on you schedule for the evening. The Cost will be $10 for adults and $5 for children under 12. 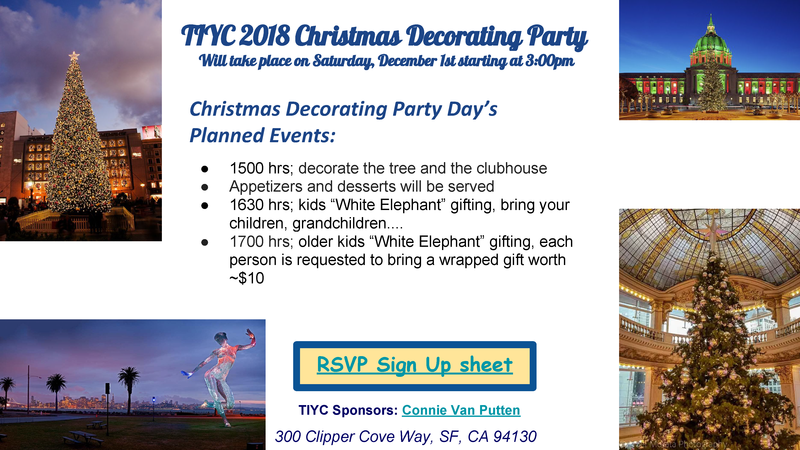 ● 1630 hrs; kids “White Elephant” gifting, bring your children, grandchildren…. P.S. 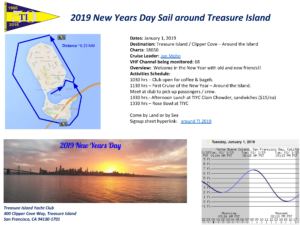 The Change Of Watch (COW) and installation of Officers will take place on January 1, 2019 following the Annual around the islands cruise. Please reserve this date. Details to follow. 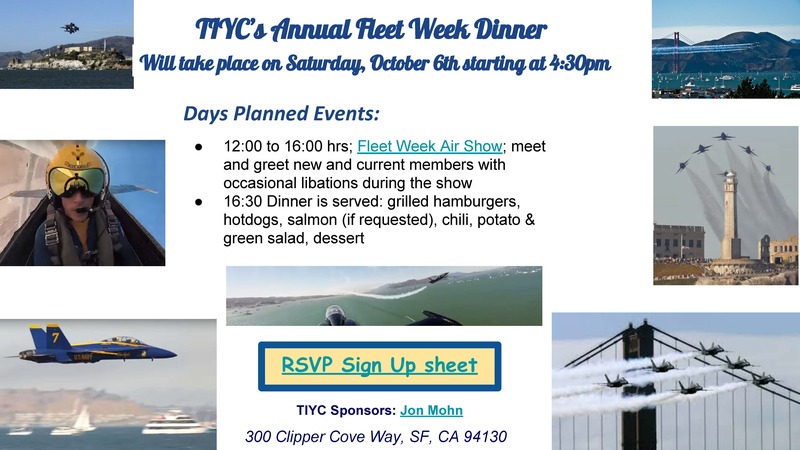 TIYC’s Annual Fleet Week Dinner will take place on Saturday, October 6th starting at 4:30pm. 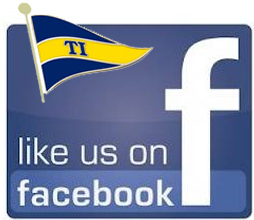 12:00 to 16:00 hrs. 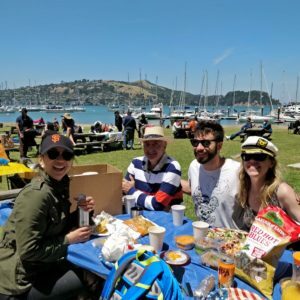 Fleet Week Air Show. 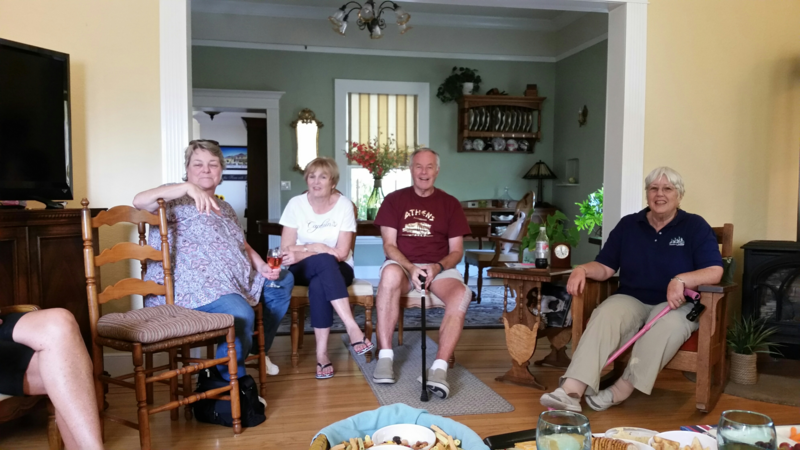 Meet and greet new and current members with occasional libations during the show. 16:30 Dinner is served: Grilled hamburgers, hotdogs, salmon (if requested) chili, potato & green salad, dessert. 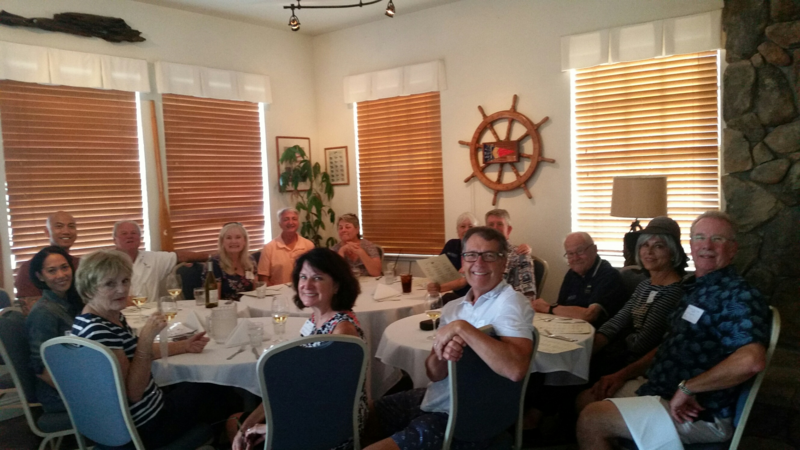 Welcome visitors from the San Jose Sailing Club and Hidden Harbor. 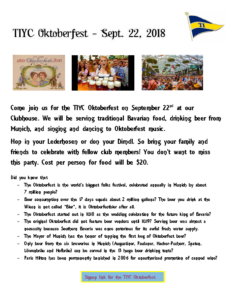 Come join us for the TIYC Oktoberfest on September 22nd at our Clubhouse from 2:00 pm to ??? We will be serving traditional Bavarian food, drinking beer from Munich, and singing and dancing to Oktoberfest music. Hop in your Lederhosen or don your Dirndl. 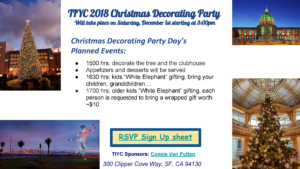 So bring your family and friends to celebrate with fellow club members! You don’t want to miss this party. 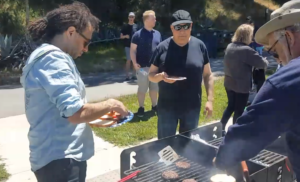 Cost per person for food will be $20. 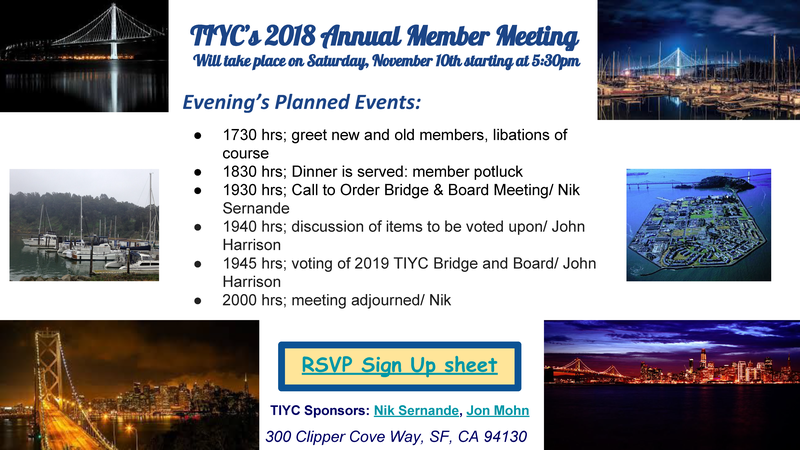 It is that time again to get ready for the Annual Meeting. A Nomination Committee for 2019 has been formed. 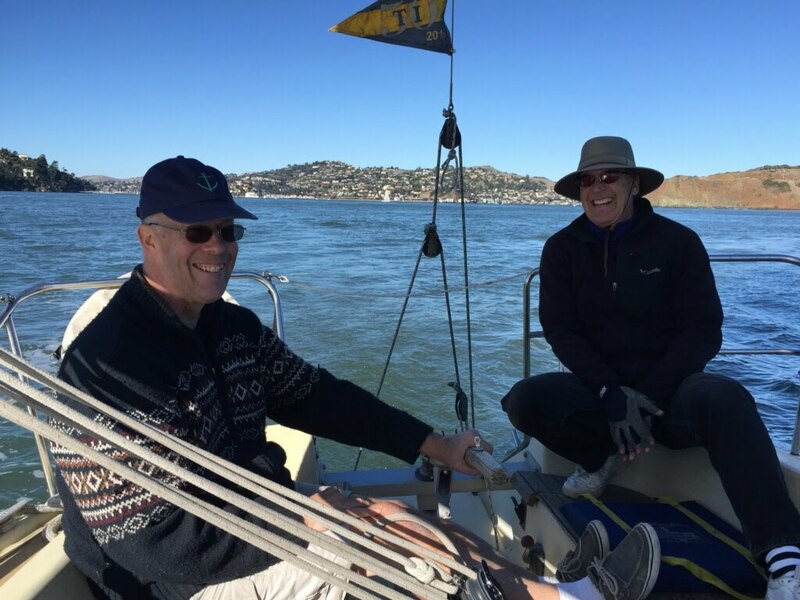 Members of the committee are Steve Lane, Atta Pilram and Bill Cole. As well as three of the six Director positions for two year terms. Please contact the Nomination Committee with your suggestions by September 10th. 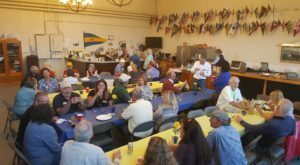 Our visit to the Benicia Yacht Club on Saturday, August 18th was quite a success. 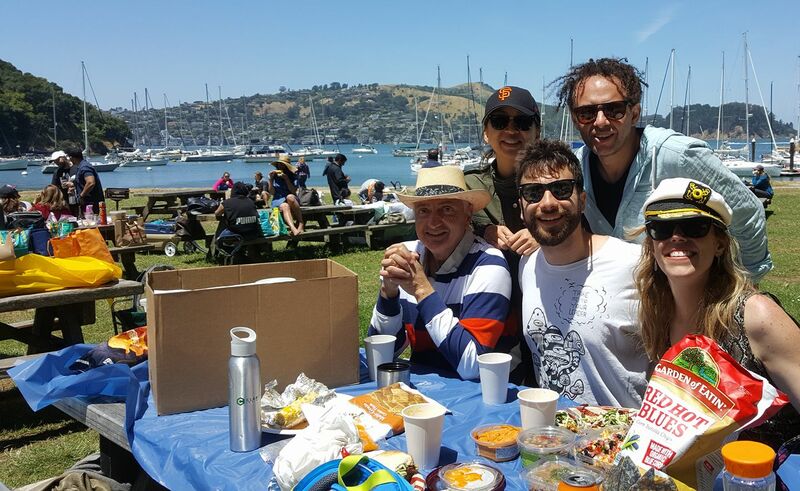 It was attended by 16 persons, 14 adults and 2 children. 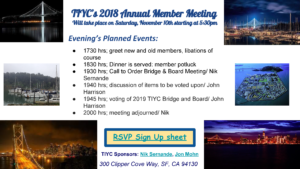 Beforehand, TIYC members Fred and Susan Gibson hosted a pre-dinner reception with cocktails and snacks at their house in Benicia. Fred is making significant progress in his rehabilitation after total knee replacement surgery. I am sure we will see him again very soon at the yacht club. 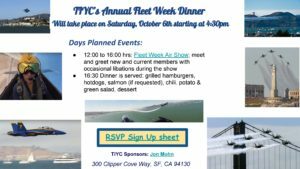 I am planning one more cruise-out, the weekend of October 20th, to a neighboring yacht club on the East Bay. Stay posted for more information! 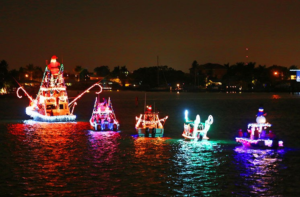 In addition, the 2018 Estuary Lighted Yacht Parade will take place on December 1st, 2018. 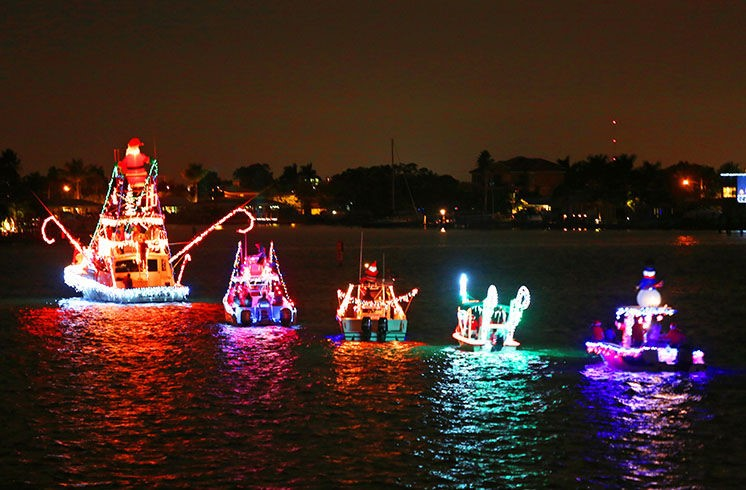 It would be great if TIYC could send at least one fully decorated boat to the parade. Anyone interested? 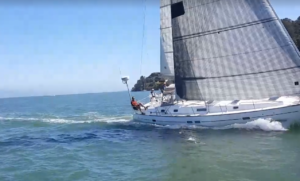 Please contact Albert Pedrazza!